How much does it cost to travel to Queensland? How much money will you need in Queensland? AU$158 ($113) is the average daily price for traveling in Queensland. The average price of food for one day is AU$44 ($31). The average price of a hotel for a couple is AU$157 ($112). Additional pricing is in the table below. These average travel prices have been collected from other travelers to help you plan your own travel budget. If you're an adventurer and thrill seeker, it's likely that Queensland, Australia is on your list of dream destinations. This state comprises of most of the eastern coast, but its main draws are the famous Great Barrier Reef and the Daintree National Park. Travelers flock to the stunning Australian Gold Coast of Brisbane. Queensland experiences a climate ranging from subtropical to tropical, but keep in mind that Australia experiences the opposite seasons than North America. When it's summer here, the Aussies are experiencing winter. You simply can't visit Queensland without seeing the Great Barrier Reef. As one of the current Seven Wonders of the World, this natural marvel stretches from Tropical North Queensland to Capricornia Cays National Park. If you're not equipped or able to go underwater for a close up view of the colors and creatures, there are plenty of other options. In some areas, glass-bottom boats let you glide along and still be stunned by the beauty of Great Barrier Reef. There are relaxing reef walks, and for a special, full view, take a helicopter ride over the reef. Another popular sight in Queensland is the Daintree National Park. Here you'll see amazing natural formations like the Mossman Gorge, incredible green rainforests, forest dragons and outstandingly colorful butterflies. Queensland is divided into several regions. With a population of 2 million, the city of Brisbane is the largest city and home to the state's capital. 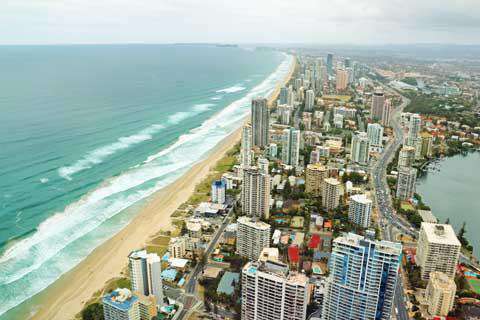 The Gold Coast region, just south of Brisbane, includes marvelous beaches and theme parks for tourists to enjoy. The Sunshine Coast, further north, contains a laid back group of towns between Noosa and Caloundra. The Whitsunday Islands is a group of 74 islands off the coast of Airlie Beach, while Outback Queensland is home to the expansive open spaces Australia is known for. Most travelers, however, find themselves in the Far North Queensland region as it's home to the Daintree Rainforest and the sought after Great Barrier Reef. Queensland is the ultimate adventure hotspot. You can explore underwater, scale mountains or ride river rapids. There are dozens of experiences available to travelers including hang gliding, camping, cattle mustering, jet skiing and riding incredible rollercoasters. While you're testing your limits and chasing your next adventure, be sure to keep your eyes out for the amazing Australian nightlife. You'll see dolphins playing in the water, flowers blooming in the lush rainforests, and fish of every color imaginable chasing each other through the coral. Queensland's coast provides the perfect spot to watch for migrating whales during the winter months  July to November. You may also find yourself greeted by the great nests of the leatherback and flatback turtles. From October to March, the nesting and hatching season occurs and tourists can watch the babies hatch and make their way toward the ocean by following the moon. It's a spectacular event that shows Mother Nature at her best. If that all sounds a bit too intense, don't worry. There are islands and beaches available for total rest and relaxation. Queensland's islands are full of leisure activities to cover all vacation types. Enjoy a round of golf, lounging on starkly white sand and sipping wine as you watch the sun set on the Gold Coast. Queensland still relies heavily on the agricultural industry. Different regions have different specialties you'll want to sample. Whitsunday is famous for its sugarcane, for example, while Kingaroy is proud of its peanuts. No matter where you are along the coast, however, you'll want to try their freshly caught seafood. Brisbane has experienced a surge in culinary interest lately, so you'll be hard pressed to find a bad meal in that region. Even while wandering the amazing parks and natural wonders, you'll still find free and clean public BBQs. So pickup some fresh meat at a local market and pack it in the cooler for a uniquely Aussie style BBQ as you discover the outback. The state of Queensland has made it incredibly easy to travel around. They offer and maintain a very extensive public transit system. Many areas of Queensland are serviced by buses, trains and ferries operating on the TransLink network. Maps, timetables and even a journey planner are available online and simple to use. One ticket on TransLink will get you anywhere in the network.